If we had to do the life and the work of Francesco Bande, both very interesting, maybe we can talk of an extraordinary “testimonial”, originating term from show marketing and advertisement, that suggest a person with a cool attribute that attest the merit of his suggestion. 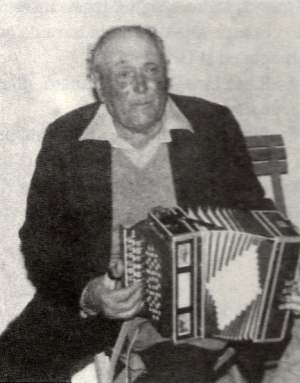 Francesco Bande is for the culture and music of Sardinia, was the virtuous of the accordion and diatonic accordion, but also was a musics author and arranger. 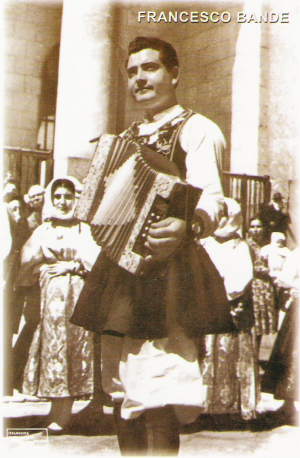 He was a tireless disclover of sardinia's traditions, in the island like in the world. With the same passion and intensity, the same ability to involve the spectator, Francesco Bande sang in the big and small folk festival in Sardinia, in a marriages and in the wide audience in Europe and America. He was born in 1930 at Bultei, an agrarian town of the Goceano, in the district of Sassari. He started very young resuming the father passion for the music, changing that in his life sense in a short time. 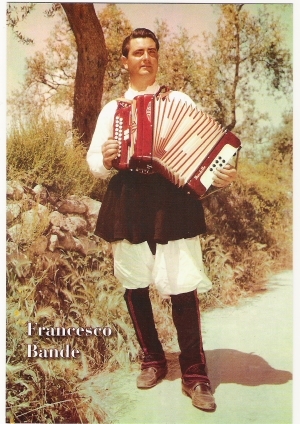 Francesco Bande was an agent of Sardinia in many national and international show, scoring a very big popularity in '60, ever in the top of the hit parade of the period. Also considerable was his artistic manufacture, like recorded disc of folk music in which “Sa Logudoresa Seria”, "Su Passu Torradu", "Sa Danza de Bultei", "Cavalcata Sarda" and other. In the last period of his life, he dead only 58 in Bultei, was involved in a big project production: a Cultural Social Club, a place where artists and musicians was able to meet with other people who was inlove of the sardinia's tradition. He did not have enough time to make real his idea, that become a spiritual testament. Will be the widow and his son Inoria to vivify the Cultural Social Club “Francesco Bande”, today a landmark for the story of Sardinia.